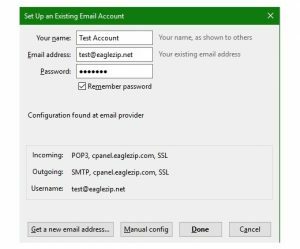 If you are setting up your account in addition to an existing e-mail account you will first click on the three bars. Then mouse over options and go to account settings. 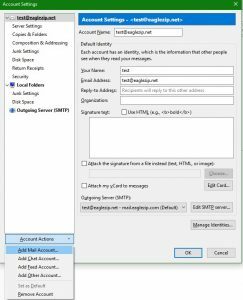 On the following screen you will click Account Actions on the bottom and Add New E-mail Account. 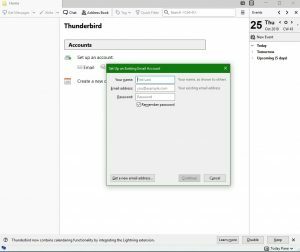 After installing Thunderbird for the first time or if you followed the above directions the screen that opens asks you to setup your e-mail account. 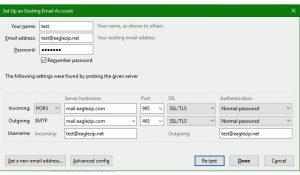 Enter the name you wish to display on your outgoing e-mails, your e-mail address, and then your e-mail password and click Continue. The next screen will say that a configuration has been found with the options Get a new email address..., Manual config, Done, Cancel on the bottom. Click Manual config. After you have ensured the information is correct you can click Done. Thunderbird should automatically check for new messages.